WATERLOO – Deborah MacLatchy, a distinguished scientist with extensive experience in research, teaching and senior administration, has been appointed the next president and vice-chancellor of Wilfrid Laurier University. A former dean of science who has served as Laurier’s provost and vice-president: academic since 2009, MacLatchy will begin her five-year term as president and vice-chancellor on July 1, 2017. She succeeds Max Blouw, who will complete his second five-year term on June 30, 2017. 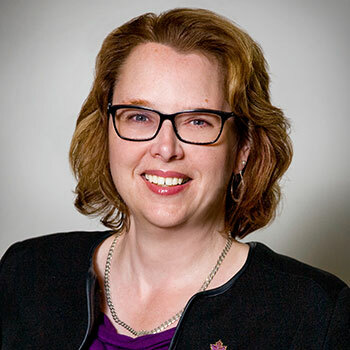 MacLatchy, who will become Laurier’s seventh president and vice-chancellor since the university became a public institution in 1973, said she is looking forward to the opportunity to lead one of the best comprehensive universities in Canada. Bowey praised the leadership of current president Max Blouw. MacLatchy earned an honours B.Sc. in biology from Acadia University and a PhD in zoology from the University of Manitoba. She did postdoctoral work at the University of Guelph, and began her academic career at the University of Winnipeg and the University of New Brunswick (UNB). She served in a number of senior roles at UNB, including dean of Science, Applied Science and Engineering and director of the International Office. She joined Laurier in 2007 as dean of the Faculty of Science. In 2009, she was appointed vice-president: academic and provost. In addition, she served as acting vice-president: research from December 2014 to November 2015. MacLatchy has played a lead role in many significant initiatives at Laurier, including: a new strategic academic plan; the establishment of innovative undergraduate and graduate degrees; development of Laurier’s integrated and engaged learning model; development of the multi-campus governance framework; the launch of the Laurier Institute for Water Science; the creation of the Laurier Centre for Women in Science; the advancement of the university’s research agenda; creation and expansion of the Office of Aboriginal Initiatives with a focus on community partnerships and support for Indigenous students; championing an enhanced focus on diversity, equity, gendered violence and inclusivity initiatives; and the implementation of Laurier’s new Responsibility Centre Management budget model. MacLatchy is an active researcher and graduate-student supervisor with a focus on ecotoxicology and comparative endocrinology. She has published more than 80 peer-reviewed publications and is funded by the Natural Sciences and Engineering Research Council of Canada (NSERC) as well as through industry and federal, provincial and territorial infrastructure grants. She is a founding fellow and past chair of the science directors of the Canadian Rivers Institute, and is a past-president and council member of the Canadian Society of Zoologists. She is co-lead of the ecotoxicology node of the Southern Ontario Water Consortium and chair of the board of the Balsillie School of International Affairs. MacLatchy has been recognized for her many achievements with a number of significant awards, including an honorary doctorate from Acadia University in 2016 and the 2015 Recognition Award from the Senior Women Academic Administrators of Canada. As well, she was named one of Canada’s Most Powerful Women for 2012 in a Top 100 list compiled by the Women’s Executive Network. Her research was awarded a 2005 NSERC Synergy Award for Innovation to recognize the successes of her industrial and government partnerships to remediate the environmental effects of pulp-mill effluents. MacLatchy was selected president and vice-chancellor of Laurier following a nine-month search process that followed the Board of Governors’ Approved Procedures for Searches and Reviews of Senior Administrators. During this process, faculty, staff, students, alumni and other significant stakeholders were asked for input on the mandate and characteristics of Laurier’s next president. Written feedback was received from over 250 individuals. At the request of the presidential search committee, consultations were also held with individuals and groups of internal and external stakeholders, including the executives of employee groups, the alumni association, the graduate and undergraduate student associations, Indigenous student leaders, government partners, and academic and administrative leaders, among others. A large number of applications were received. Following a rigorous evaluation and interview process, the presidential search committee — whose members represent faculty, staff, students, alumni and the Board of Governors — voted unanimously to recommend MacLatchy be appointed as the next president and vice-chancellor of Wilfrid Laurier University for a five-year term commencing July 1, 2017. The appointment was recommended unanimously by the university Senate and approved unanimously by the Board of Governors this week. View a video interview with Deborah MacLatchy. Laurier is a leading comprehensive university known for academic excellence and a culture that inspires lives of leadership and purpose. Laurier has a deep commitment to both teaching and research, combined with a strong student focus and distinct sense of community. As the university’s mission statement says, Laurier has a commitment to global engagement and challenges people to become engaged and aware citizens of an increasingly complex world. With roots stretching back to 1911, Laurier now has more than 19,000 students at campuses in Waterloo and Brantford, and locations in Kitchener and Toronto, and an office in Chongqing, China.